A very inspiring story and an historic medal winner to a very deserving youngman.Every Kentuckian and American should be proud. Thanks for your service young man!!!!!!! That’s a hero! He needs a 30 minute ovation Saturday. Well done KSR. Very fitting end to the day. Nothing can be said to add to that. Wow. This guy is awesome. I saw part of an interview with him earlier and he seemed to be more upset about those that he couldn’t save than anything. He doesn’t seem to enjoy his accomplishment because not everyone survived. What a tremendous heart. Thanks for putting this on perfect way to end the day! I would love to see this young man be the “Y” at a UK basketball game. TRUE greatness on the floor at Rupp. 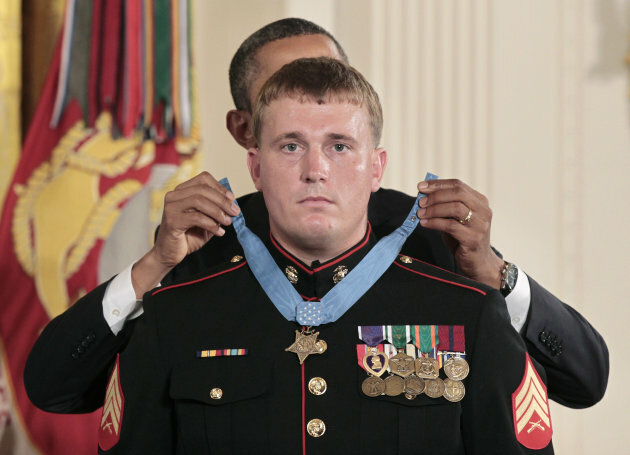 Thank you, Dakota Meyer! Something for all Kentuckians to be proud of………..be proud. what an amazing human being. If only we could be half the person this young man is…. Doing the Commonwealth proud. Honored to be from the same state as you, Meyer. A true, amazing hero. So proud that Dakota is a fellow Kentuckian….he DEFINITELY has got to be the “Y” sometime this year! Pride not only for Kentuckians but all United States Citizens! You never know, he saved all of these men for what they and their future generations do to follow. This young man is what every other American should strive to be. I couldn’t be more proud of a fellow Kentuckian for his selfless acts to not only the Marines that he assisted but also the Afgan patrolmen that he rescued. I hope that he can one day forget the terrible events that took place on that day but never forgets that there is an entire nation that has nothing but love and respect for him. Than you for reminding us, Mr. Jones. Some things are bigger than sport. Thank you for reminding us, Mr. Jones. Some things are bigger than sport. as someone who has served in the military…he did what we all hope we would do in that situation, but very few would. he truly is a bad s.o.b. just hope i’m lucky enough to end up in a bar with him some day, we all owe him a beer. That sounds like it’s straight out of a Call of Duty video game, except Dakota Meyer didn’t have the benefit of a ‘restart’ button once he went all in. Much respect to this hero, very deserving of the Medal of Honor. Netflix “Restrepo”. Watch it to get a true appreciation of the soldiers in Afghanistan. all i can say is wow and congrats…a true american hero! GO CATS! This was a 21 year old man who thought little of his own life to save many includin recovering bodies that had fallen to war. This man is awesome and thats all u can say. To be the first marine in 4 decades to receive the award instead of his family shows true character and true heroism. Most ppl who receive this award, their family gets it. May God bless u Dakota Meyer. U are a true inspiration. And congrats on havin some beer with prez. Semper Fi! Did Matt Jones cut his hair? …and American parents, you’ve got to quit naming your kids after places, tribe names, and surnames. The guy that names his kid “Dakota,” “Cheyenne,” “Riley,” or “Paris” is the same guy who thinks that McMansion chandeliers are great and should be placed in front of the 48-inch LG flatscreen TV in a living room that overlooks a white concrete driveway (equipped with basketball court)…there’s probably a trampoline somewhere in the vicinity of the driveway, as well. What an awesome representative of our state and the American spirit! It’s truly a shame that while we all celebrate his bravery this will forever be a source of great pain for him. Maybe the football team should dedicate this one to him. Considering the game is being played between UK and UofL for the Governor’s Cup at a place called Commonwealth Stadium, it would be awesome to see him honored at halftime like they’ve done so many other folks during games. As a soldier and fellow serviceman, congrats CPL Meyer and thank-you for a job well done. Proud to be a Kentuckian and an American. This Marine deserves the recognition. This guy makes me proud to me from Kentucky! would be cool to get him as the Y during UK game this yr. He was a Corporal, Promoted to Sergeant. They announced it incorrectly when giving him the medal. Sergeant Meyer, Thank you for protecting our Freedoms. You are a true hero. This brave man we Americans are proud of. We should honor him. We need to be very alarmed at the aggressive, non defensive, illegal acts of terror and imperialism that our military engages in. Poll after poll reveals that most Americans don’t want to spend trillions of dollars attacking other countries and killing millions of dads, moms, children in those countries. In the name of what? Certainly no value that a true American believes in. Our military is under the command of the bankers who own this country. It orders Obama or Bush or Clinton or Bush Sr around and tells them what war to start. Libya is by no means over, it will be one of the bloodiest civil wars we will interject ourselves into, and which we started. Next is Iran or Syria. Ron Paul would first audit and ultimately abolish The Federal Reserve System, which is private banking cartel which controls our government, and NOW control’s Libya’s. It also now controls Iraq’s. The previous leaders of those countries would not submit to the bankers’ demands, which was to continue to accept the American “dollar” (Federal Reserve Note). They know it won’t be worth much within a few months or years. You should too. Our dollar is on the verge of a collapse. Ron Paul is sounding the warning voice, has been for decades. He is a true statesman, a historian, an economist of the highest order, and a medical doctor as a profession. But first and foremost, he is a true American, who swears allegiance to the U.S. Constitution, which is what EVERY soldier takes an oath to defend. Every politician does too. But regrettably few uphold it. Our soldiers are being used for un-American purposes. Fortunately, there are many soldiers and vets who stand with Ron Paul. In fact, he gets more donations from all other candidates combined. #48–we hear you alex jones. got any new books for sale? This man should definitely be the “Y” at a home basketball game and should be honored at one of our home football games! Truly a Wildcat Nation Hero…….Go CATS!!! its a shame that we couldnt get a true American to put that medal around his neck that stands for the military. U-S-A, U-S-A, U-S-A, U-S-A! God Bless this young man. Matt, you need to contribute more to the site – well done. I hope everyone remembers what this young man looks like, at the very least, he should never have to pay for his own dinner or drinks anywhere! That was a quite a story (watch the CNN clip). They went back 5 times! wow! This guy sounds like rambo in that description. What a hero. 48 here’s why your a dumbass, do you and Ron Paul honestly think that if we pull out of all the areas of the world that we are currently in right now that the enemy will stop attacking or for that matter even prevent larger events from occurring? Tell me your not a total moron. His dad, Mike Meyer, is an AGR from UK who graduated around 1980. I am from greensburg and used to substitute teach at Green Co and had Dakota in a number of classes. He was always a good kid and now hes a hero.